But this isn’t about tonight’s red carpet slaw. This is about the bridal shower slaw I made two weeks ago. Now in case you’re thinking slaw isn’t exactly bridal shower fare, ask yourself if you’ve ever known a bride-to-be who wasn’t carefully monitoring her caloric intake so she’d be at her skinniest on the big day. Right. The last thing you want to do is throw a party with a bunch of food the poor girl can’t even eat. 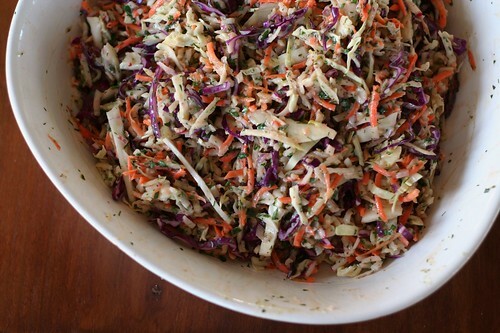 Hence the slaw. Also I just really like slaw, and this particular slaw is particularly good — the crispy crunchiness of shredded fennel, carrots, cabbage, and radishes mingling with the brightness of fresh herbs and the tanginess of yogurt in what is essentially freshness in a bowl. And, hey, freshness is hard to come by in February; take it where you can get it. 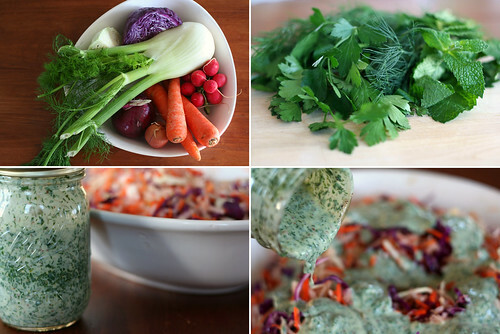 1) Shred the carrots, fennel and radishes using a mandoline or food processor. Slice the cabbage thinly with the mandoline or a serrated knife. Toss together, along with the onion and shallots, in a large bowl. 2) Whisk together half the lemon juice, the olive oil, herbs, yogurt, and mustard. Season to taste with salt and pepper. 3) Pour the dressing over the vegetables and stir until well-coated. Taste and adjust seasonings. Squeeze the remaining lemon juice over the slaw just before serving. This entry was posted on February 22, 2009 by Megan @ When Harry Met Salad. It was filed under fruits & vegetables, salads & dressings and was tagged with buttermilk, carrots, fall, fennel, fresh herbs, onion, radishes, slaw, winter, yogurt. But is slaw better than “Slumdogs” in a blanket? Alas, the world may never know . . .
I’ll take my chances with the dress and chose pigs in a blanket any day. Not a cabbage fan myself, your write-up makes me want to go out and eat some slaw. Yum. I have some fennel in the fridge. I think I’ll try this tomorrow. Thanks for the inspiration! This looks fantastic! It reminds me of one of my recurring problems with yummy vegetable dishes: what do you serve it with if you want a vegetarian meal? Obviously, you could serve it with pork chops, but if you were making this for yourself, what else would you eat to make up a meal? 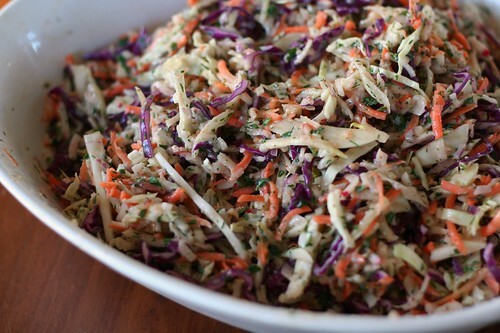 I love slaw. This looks yummy!